THERE'S nothing the internet loves more than a problem that has stumped everyone else in its path, but when that problem is aimed at seven year olds, you know there's something especially weird about it. 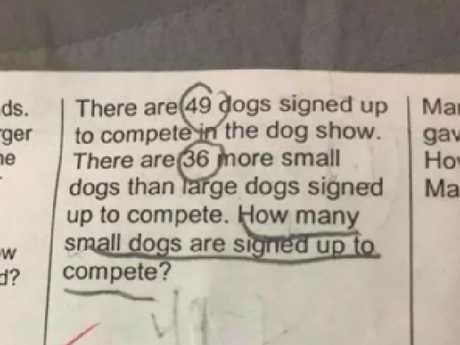 The latest head-scratcher to go viral has done so via mum Angie Werner, whose daughter, Ayla, came home from school with a particularly gnarly maths problem to conquer. 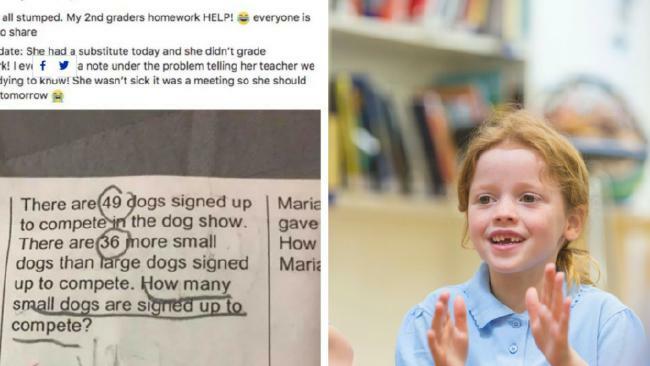 The second-grader's homework featured a word question that left her mother confused, so Angie decided to turn to an online mum's group for some help. OK, we're all stumped," she posted in private Facebook group, Breastfeeding Mama Talk, along with a picture of the problem. 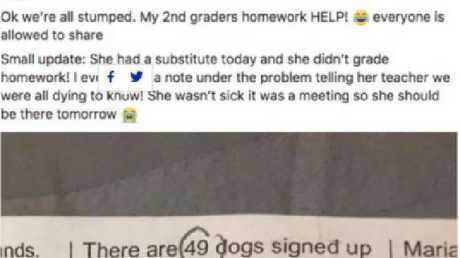 "My second-grader's homework - HELP!" The mother posted the maths problem on Facebook. "There are 49 dogs signed up to compete in the dog show," the question begins. "There are 36 more small dogs than large dogs signed up to compete. How many small dogs are signed up to compete?" Sadly, it seems journalism and maths skills rarely live together in the same brain, as no one in the Kidspot office had a hope in hell of figuring out the problem - and the responses Angie got on her original post were many and varied, leaving most stumped as to the true solution to the riddle. Yep - we know. You can't have half a dog. You don't even want to think about half a dog. 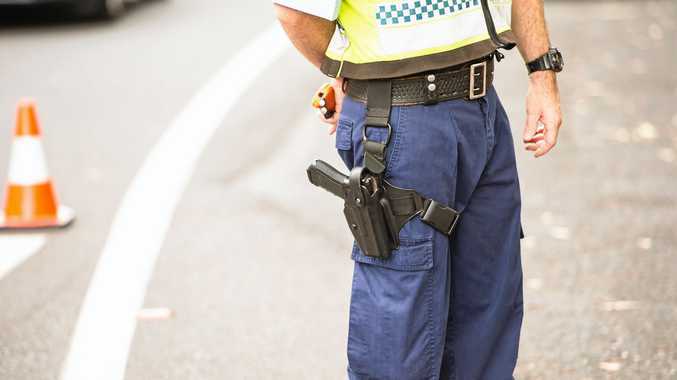 WHAT KIND OF DERANGED SCHOOL CURRICULUM FORCES CHILDREN TO IMAGINE DOGS CUT IN HALF? "The district worded it wrong," Angir told POPSUGAR in an update. "The answer would be 42.5, though, if done at an age-appropriate grade."